It shouldn't matter what the resistor is made of but you need to look at the wattage rating. I used two 1 amp 10 Watt resistors (one on each speaker). Anything with a higher watt rating is even better (but bigger and more expensive). Don't buy a little 1/4 watt resistor and think you are good. If its low ohm it will burn out instantly. OK, I’ll buy some next time I’m over there. So, I made a mistake. I accidentally bought 1/8th watt resistors. :z I’m assuming I’ll probably blow these up if I get anywhere near 1 watt, right? That was the only wattage they had 1k and 10k resistors in, however I did get 1 watt resistors, although they are 100 ohms and 1k ohms. Will they work? I was under the impression that all that matters is that it is a 10:1 ratio. I don’t have my second Y-connector, I apparently let my friend borrow it, but I’ll get that tomorrow night. You are talking about 2 separate setups and need different resistors for both. For the way I set it up you need a 1ohm 10 watt resistor on each speaker. This is not the same as Kens suggestion that uses the line out voltage divider. His setup can use a lower watt resistor (not sure how low) because they are higher ohm. You need to use the ones he suggested. And its not just a 10:1 ratio. Its a 10:1 ratio with the correct high total ohms and the proper watt resistor. I would just take Kens advice and just spend $40 for the line level device he suggested. You will end up spending half of that in parts, figure out how to put it together with a circuit board, and hope you get it right. This way you know it will work. Sorry, I knew I was talking about two different circuits, next time I’ll remember to make the switch clear. Ok, so I’ll use the 1k and 10k resistors as a test. I found some breadboards (I think that’s what they are called) and I’ve been assembling it on that. I’ve got almost everything done, I just need to attach some form of connection for the speaker cables and swap out the resistors. I’ll test it briefly with the 1/8th watt resistors, then find (or order) some 1 watt versions. I know that the line level device would work better, but I don’t have $40 to put into an experiment if I don’t know that it’s permanent, and I don’t think my dad will let me accept the one as a gift from Ken. Polkies are always helping each other out, I have the Russound and would happily loan it to you. Just PM me your address, then you can send it back when you're done if that is preferable to your dad. Exactly what my dad thinks. Usually I would ask, but last time he seemed very on edge about it, I’m really worried he’d ask me to leave the forum altogether. And IMO, the Russound isn’t worth that, I don’t think anything I’ve been offered is worth that. Speakers, tweakers, and size 5 sneakers. I love this thread. This is exactly what got me into Polk Audio. Back in the mid to late 80's, I was in high school and starting college (EE), I was into audio, building my own speakers and playing around with multi-speaker setups and phasing to cancel crosstalk. I had some success but never achieved what I was listening for. 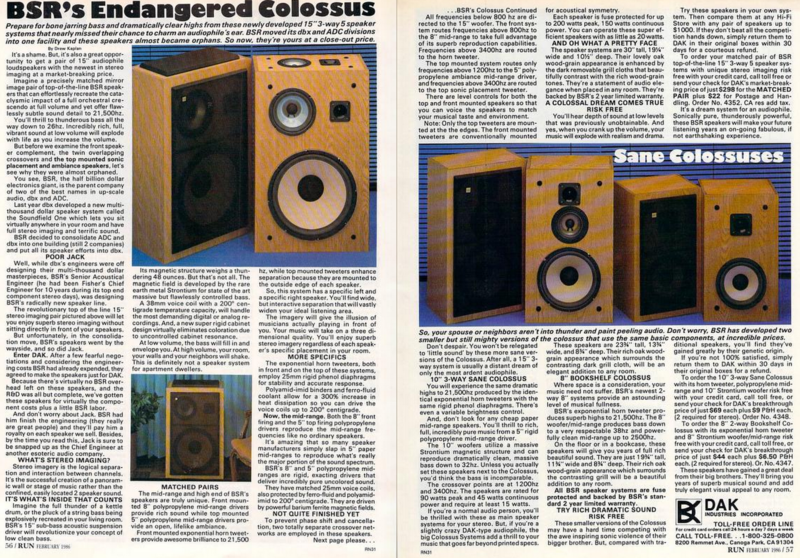 At some point I found a magazine article about Polk Audio's SDA speakers and was disappointed that someone beat me to it but thought it was pretty cool. Then I noticed that they were in my home town of Baltimore and was hooked. My first manufactured speakers was a set of Pioneer ProMusica 120's but had my eye on Monitor 7's, then 10's. In 1991 I bought my first set of Polks, RTA-11TL and still have them today. About that time I saw an ad for an engineer at Polk Audio. Having just gotten my EE degree, I applied but didn't get the job. I knew it was a long shot. Funny thing is that I've never owned a set of SDA's and only had the pleasure of listening to a set of SDA 1.2TL's once at a shop in College Park. Many years later, at my church, I met a friend who used to design for Polk Audio and actually designed my RTA-11TL's. He claims to have a set of his own "Signature" SDAx.xTL prototypes tucked away. I'm hoping I can convince Zvonko to pull them out for a listening session some day. He left Polk in the early 90's. It is funny to think that I may have applied for his job. I hope you achieve the desired SDA sound stage. The advanced drivers and cabinetry of the LSi combined with SDA could be really cool. You have the advantage of seeing what Polk did previously with phasing and even adding additional speakers to the array. Very cool post Stan, thank you so much for sharing. I love this thread. This is exactly what got me into Polk Audio. Back in the mid to late 80's, I was in high school and starting college (EE), I was into audio, building my own speakers and playing around with multi-speaker setups and phasing to cancel crosstalk. I had some success but never achieved what I was listening for. 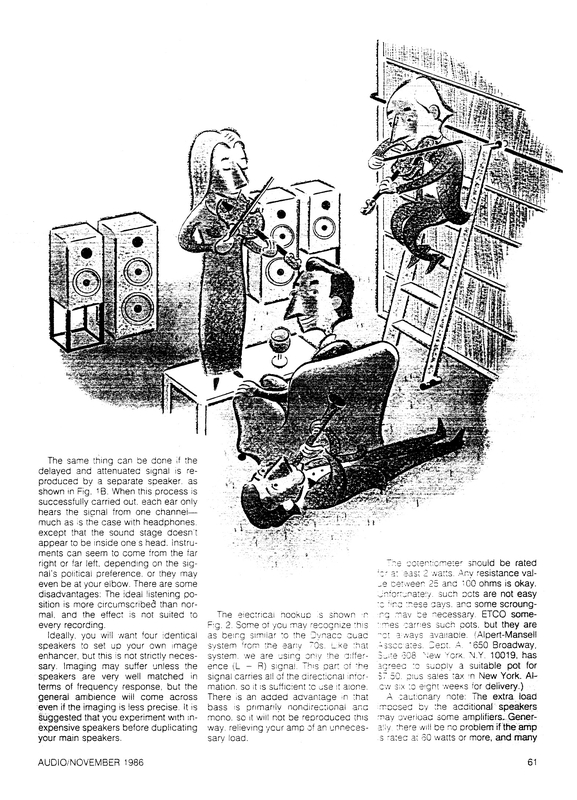 At some point, I found a magazine article about Polk Audio's SDA speakers and was disappointed that someone beat me to it but thought it was pretty cool. Then I noticed that they were in my hometown of Baltimore and was hooked. My first manufactured speakers was a set of Pioneer ProMusica 120's but had my eye on Monitor 7's, then 10's. In 1991 I bought my first set of Polks, RTA-11TL and still have them today. About that time I saw an ad for an engineer at Polk Audio. Having just gotten my EE degree, I applied but didn't get the job. I knew it was a long shot. Funny thing is that I've never owned a set of SDA's and only had the pleasure of listening to a set of SDA 1.2TL's once at a shop in College Park. I hope you achieve the desired SDA soundstage. The advanced drivers and cabinetry of the LSi combined with SDA could be really cool. You have the advantage of seeing what Polk did previously with phasing and even adding additional speakers to the array. I thought I had a fairly original idea with this... seems like I was very wrong. Don't feel bad. I thought I had invented bi-wire speaker cables before joining here. I came up with the idea of running two pairs of speaker wire to each speaker, doubling the wire gauge. I thought I would be applauded for my ingenuity. Then I join here and I find out bi-wire cables already exist. I didn't even get to name my invention. I would have probably called it Double-Wire or TTW (twice the wire). Then once I joined here I kept getting bi-wire and bi-amping mixed up. I thought they meant the same thing. There is very little in the way of innovation at this point. It’s more about perfecting the technology and design. There are new driver designs that are intriguing but I’m not sure if they have any lasting power. Just because someone thought of it and did it first doesn’t take away from the ingenuity of the idea. After all, there was a point in history when the wheel was not a ‘thing’. Even though Ken is cracking jokes (and funny ones I might add) I get where your Dad is coming from dude. The internet is an odd place, can find good friends or enemies can find you without you having any idea you left traces. You can always do what we try in times of new gear "you don't remember I bought that a while ago but didn't need it until now"...he won't be none the wiser. oldie memory in this thread -- courtesy of the (in)famous Mr. Drew A. Kaplan ("DAK"). I get where he is coming from as well. I think it would be very good to exercise caution on say, AK, and even here, but I am a lot more trusting here than I would be at AK. I think he'll realize that Y'all just wanna help at the Miami expo next year... I assume I'll be seeing at least some of you guys there, right? Or tell him to give me a call. While I wasn't as young as Trey, I did join this forum as a teenager and credit so much of who I am to this forum and the knowledge and friendships I've gained. I'm not sure I ever said this publicly, but the arrangement the forum sent to my wife's memorial service brought tears to my eyes then and still does when I think about it. My closest friends are here and a few aren't exactly within driving range. 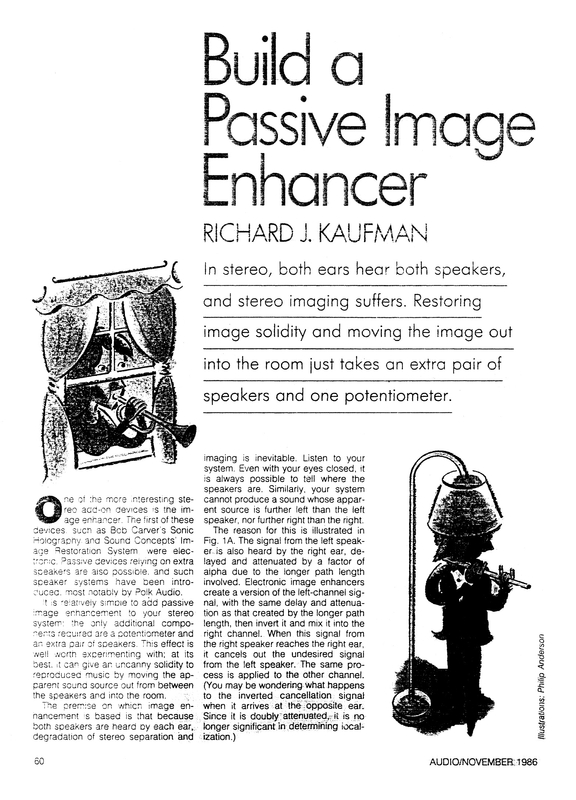 Audio magazine published an article titled "Build A Passive Image Enhancer" in their November 1986 issue. Attached below is a PDF scan of the article and photo scans of the article pages. During Polkfest 2008, Matthew Polk demonstrated an SDA system consisting of four LSi9 loudspeakers with timing control provided by a Rane digital signal processor. Matthew mentioned that he and a Polk engineer had worked on the DSP algorithms for several months, and that they still had work to do. Figure 1. 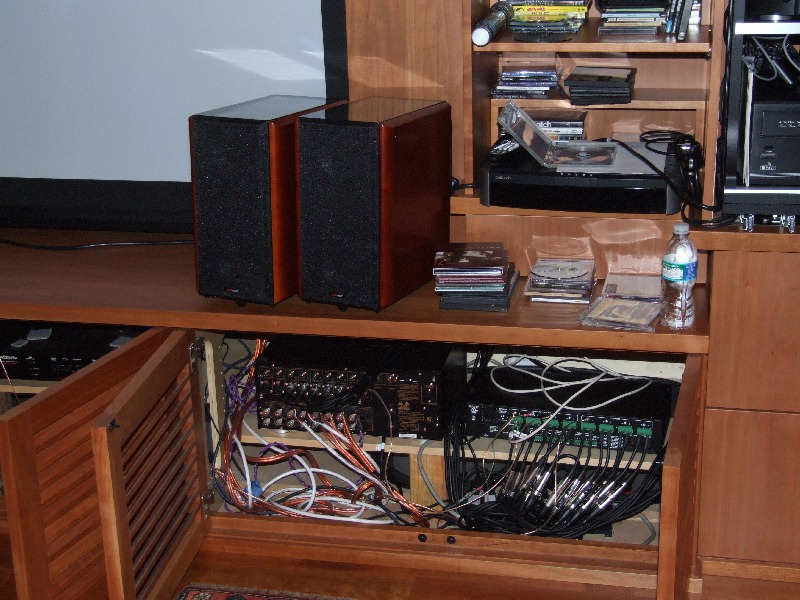 Right side LSi9s and Rane digital signal processor in Matthew Polk's home theater system. Figure 2. 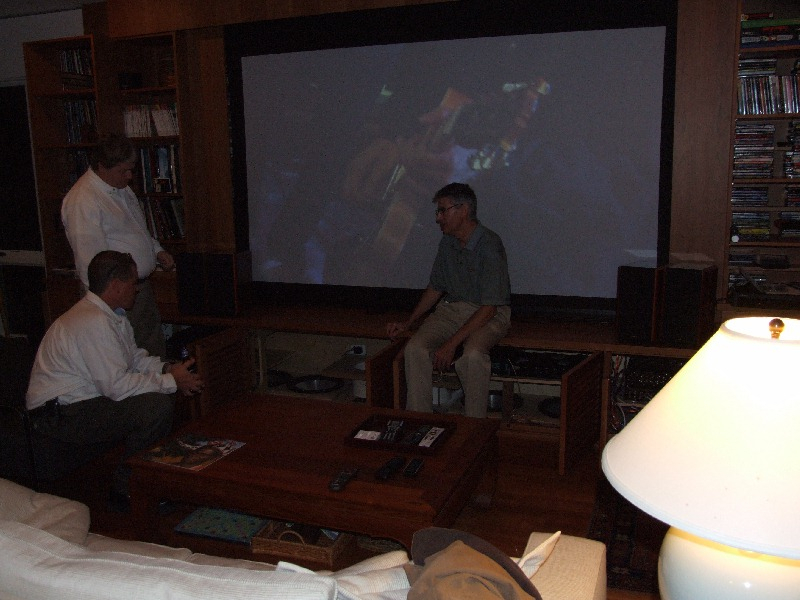 Matthew Polk sitting between the SDA-configuration LSi9s in his home theater system. Something like this would be of interest to an SDA enthusiast who found a conventional speaker with sound quality that he/she preferred over the SDAs, but didn't want to give up the panoramic sound stage of SDAs. I extracted the full color "Passive Image Enhancer" article from the magazine link. The people I've met on this forum have pretty much shaped my entire life. No exaggeration. That's it! 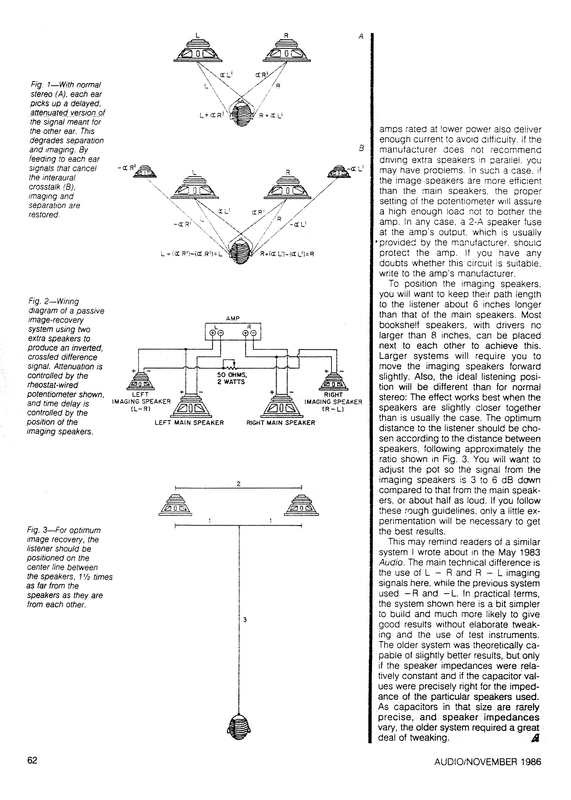 I used to have a subscription to "Audio" and that article got me started playing with speaker arrays and phasing. 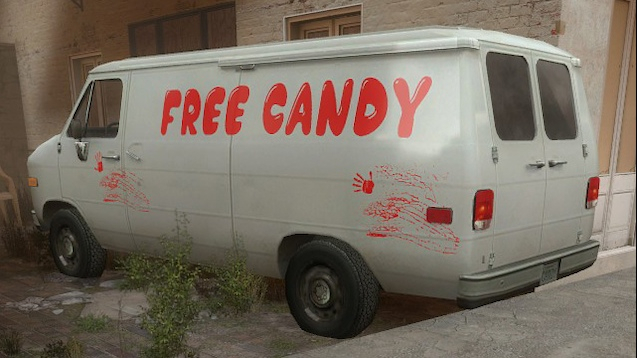 I remember the guy with the clarinet behind the sofa. Really cool about Mathew Polk and the LSi9 SDA too. I think the LSI9s are great speakers! I would totally invest in LSI9 SDAs!! Skip, I’ll ask my dad about giving you a call tomorrow. Just out of interest, how old were you guys when you joined? I didn’t realize that there were others here who joined when they were about my age, until 2 weeks ago I figured out who “Sid the Kid” was. DK, thanks for the very interesting article! Only 2 words. Cable management. I think he'll realize that Y'all just wanna help at the Tampa expo next year... I assume I'll be seeing at least some of you guys there, right? This was during the "work in progress" stage. Hmm, I joined in 2003... 13 or 14? Attended my first Polk fest at Polk hq at 15 or so?